Just a short walk from everything. Spacious and modern, with all the amenities of home, including full kitchen facilities with microwave and dishwasher, Oaks Lure Apartments invites guests to relax in style and comfort after a day’s boating, swimming or relaxing poolside. The Oaks Lure Apartments sunny decks and courtyards, heated lap pool, children’s wading pool, barbecue area and landscaped gardens create an oasis for guests, and the friendly service ensures visitors return again and again. Located in the centre of town, Oaks Lure Apartments is a short walk to Port Stephens, the marina, restaurants and shops. 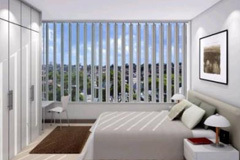 Lure’s air-conditioned 1 and 2 bedroom apartment accommodation all have high ceilings and generous living spaces. The Oaks Lure Apartments Nelson Bay welcomes you for an unforgettable vacation.